Due to the Thanksgiving holiday here in the US the Sunday Stamps deadline is extended until Dec.4th. I created another card for the sketch using an image from SugarPea Designs. My youngest turned 17 on Nov.20 and his grandpa sent him a card and iTunes gift card so I needed to whip up a thank you card for him! 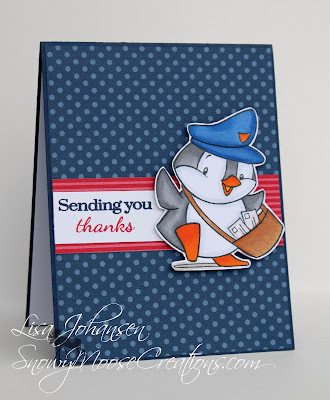 This sweet image is from SugarPea Designs Happy Mail set and I paired him with the colors that make me think of the postal service, red and blue! 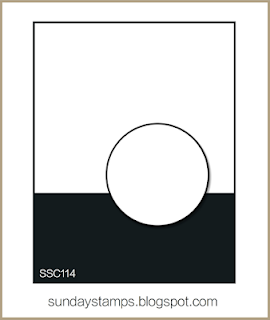 I used the strip of red DSP to divide the card front into 2 sections like the sketch, and of course the penguin takes the place of the circle shape. Head on over to the Sunday Stamps blog to play along with us, we'd love to see what you create!